A nine-fight untelevised preliminary card will kick off the upcoming "Strikeforce: Diaz vs. Cyborg" event on Jan. 29. Who among your favorite Strikeforce fighters will make it to the top? The upcoming Strikeforce: Diaz vs Cyborg will kick off with a nine-fight preliminary card on January 29. The event will feature a welterweight title match between Nick Diaz and Evangelista Santos in the main card. In addition to this, Ronaldo Souza vs Robbie Lawler will also green lit the event. The preliminary card will feature Nate Moore vs Nate Coy, which was supposed to take action on Strikeforce Challengers 13. Unfortunately, their match was moved a few weeks. More over, the card will also include Germaine de Randamie vs Stephanie Webber. Other bouts will feature Bobby Stack vs Isaiah Hill, and Eric Lawson vs Ron Keslar. 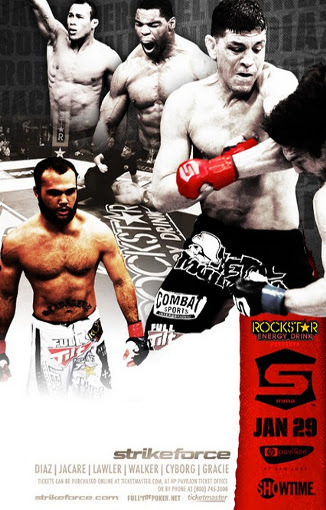 Watch Nick Diaz vs Evangelista Santos live stream – Strikeforce Diaz vs Cyborg Fight here. Strikeforce: Diaz vs. Cyborg, is an upcoming mma event held by Strikeforce.